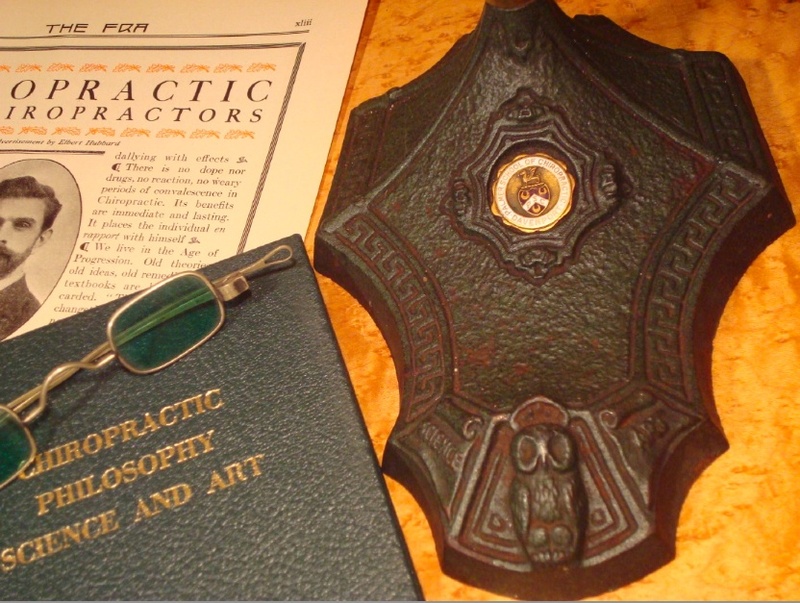 Antique Collector, Todd Waters, is "The Chiro-Picker"
This time I feel I’ve come across a really special chiropractic antique! It’s a student desk lamp from the Palmer School of Chiropractic. The lamp was made by Robert Schwartz & Bro from New York City under the manufacture name SROBERT. It is heavy-duty cast iron and designed quite elegantly. The first feature that caught my eye was the words “Science and Art,” with a carved owl between them. Up above the owl’s head is the Palmer PSC crest embossed in a beautifully detailed coin. I thought the owl might be the mascot of Palmer’s radio station WHO. But this seemed kind of odd since the WHO was located in Des Moines, while Palmer’s original station, the WOC, was located on the PSC campus in Davenport. Also, I had a feeling this lamp predated the station WHO which Palmer acquired in 1931. Then I just assumed the owl represented wisdom, enlightenment, and education. I showed the lamp to two Palmer grads who live, eat, and sleep the philosophy of BJ Palmer. They too were troubled by the owl, and both agreed Palmer would have used the words “Science, Art, and Philosophy” on the lamp. For some reason, the word “Philosophy” was missing and in its place, an owl. Why? It was uncharacteristic of BJ Palmer to leave out the word Philosophy. Questions arose if the lamp even was a legitimate piece or not. Everything about this lamp told me it was an authentic antique though — the Art Nouveau detailing, the heavy cast iron metal, the cloth wrapped cord, and even the faint signs of rust, all convinced me this item was around 100 years old. But if there was more to learn about this item I wanted to know the answers. People love to own antiques, but part of that love comes from the story behind the item. Consequently, if there is no story to tell, the item has less intrinsic value. People like to tell stories. So my work as the Chiro-Picker was not finished. What was the story behind the owl? I did an Internet search on the maker, Robert Schwartz and Bro, and found other lamps they had made. Some lamps were quite different than mine. But a few also featured the words “Science and Art” with the wise old owl in between them. However, these other lamps featured the coined emblem of another school or fraternity. I surmised SROBERT made a standard model lamp for upper crest groups which would then be personalized with the addition of the emblem placed in the center. The owl was just a scholarly design and was not hiding a Palmer secret meaning. Another thing I discovered was the other lamps had patent dates of 1920’s stated on their bottoms. My lamp stated “Patent Applied For,” meaning this lamp was made before the 1920’s. One concern I had about this piece was the electrical cord. The plug looked rusty and unsafe. My electrician verified the plug needed to be replaced, and he too was concerned with the old cord. As an antique collector, I could tolerate replacing the plug, but a new chord would entirely change the look of this historic piece. I didn’t want to do that! But I did want this lamp to be functional. Luckily, we were able to keep the original cord and maintain its vintage look. Now the lamp is in good working order and ready for use and display — a crowning jewel to a vintage Palmer collection. 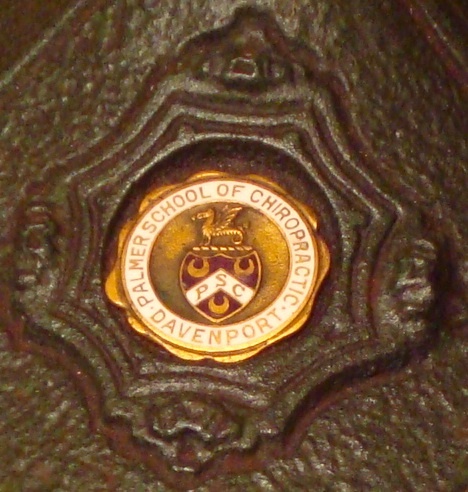 ….Not when it’s a relic from a bygone age, cast iron, and from America’s oldest and largest chiropractic college — Palmer College of Chiropractic. For those of us not familiar, the PCC (originally called the Palmer School of Chiropractic) was founded in 1897, and rose to prominence (as did the profession) during the earlier part of the 20th century under the guidance of its magnanimous leader, Dr BJ Palmer. Writer, doctor, inventor, lecturer, and early radio pioneer, Palmer was all of these — but even more, the Developer and staunch defender of the Philosophy, Science and Art of Chiropractic. 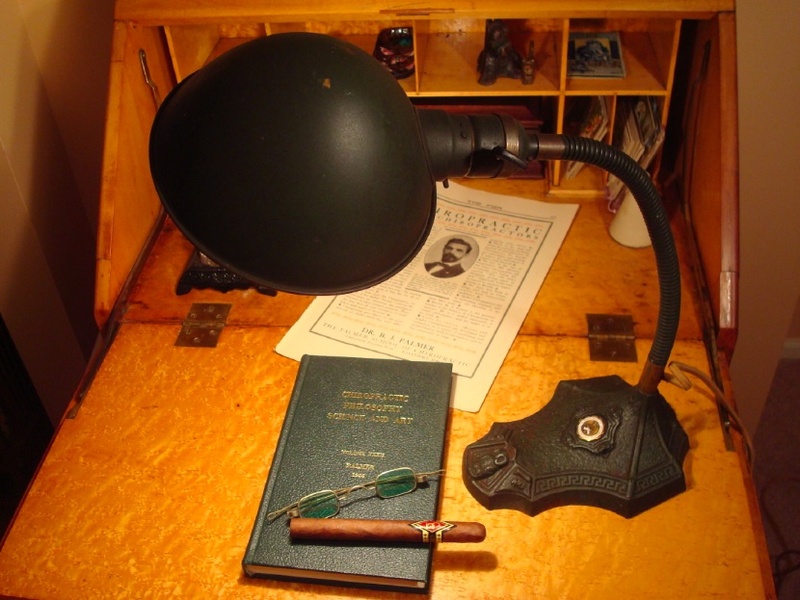 Those of us that collect Palmer memorabilia, treasure like diamonds the finds that the Chiro-Picker comes up with — in this case a Palmer School of Chiropractic Lamp. Never seen before by these eyes, the lamp is interesting because it has the words “Science and Art” on its base — but not the third word which Palmer used to describe his profession –“Philosophy”… only an owl. 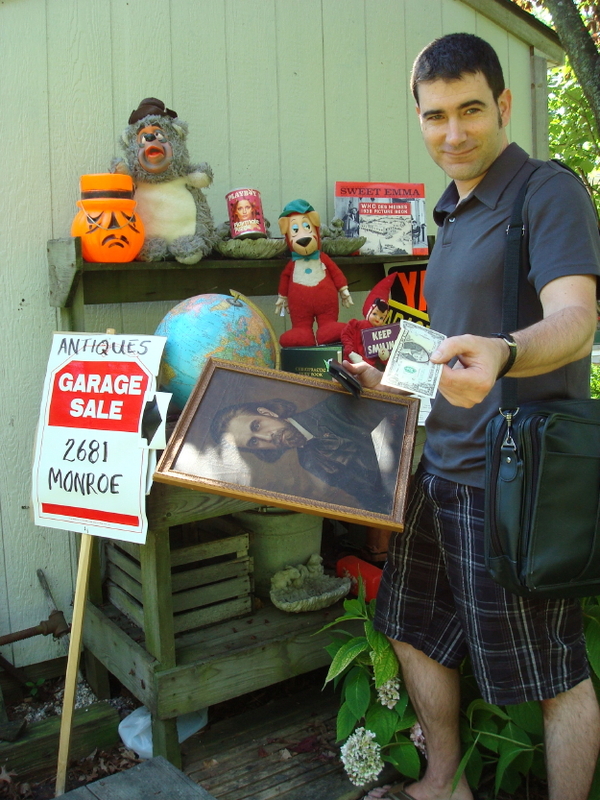 Dr. Bob Kauffman is an avid chiropractic history buff and collector. He is a 1988 graduate of Palmer College of Chiropractic and practices alongside his chiropractor-wife in Merrillville, Indiana. Unfortunately he was absent the day they passed out the lamps. Want to stay on top of Chiro-Picker’s latest finds? We’ll send you an email. Click Here to Sign Up. Chiro-Picker Stumbles Across Photos of Lamp in Use at the BJ Palmer Clinic! 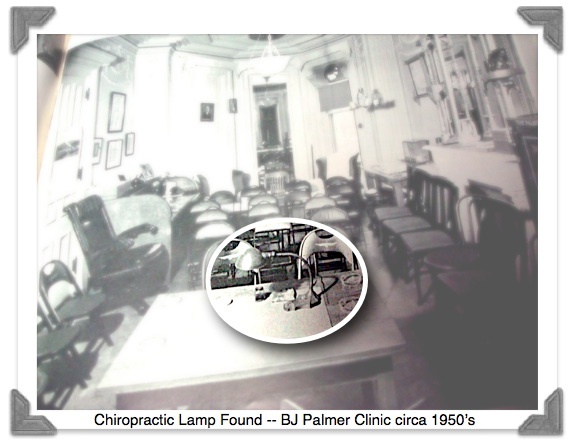 Just in case some were skeptical as to whether this lamp is a legitimate piece of chiropractic history or not: check out this picture from the BJ Palmer Clinic, circa 1950, our Chiro-Picker dredged up. This is just but one example… the Picker has more!